Will the future be like the past? All of life seems to be connected. Cause and effect. If I touch a hot stove today and get burned I can safely assume that I’ll get burned if I do it again. And that goes for different kinds of stoves, open fires, barbecues, fireworks, etc. This kind of thinking—from specific instances to generalizations—is inductive. So what’s the problem? Inductive thinking seems to be pretty useful so why all the hubbub? Blame Davi Hume. It all started when he wondered how we could be justified in assuming that the connections we perceive between events, cause and effect, actually exist. We certainly feel like we see the connection between events. That’s not Hume’s point. He acknowledges that we all do that. He’s asking a much more basic question. How do we justify our expectation that the future will be like the past? This is the problem of induction. An exchange between Jonah and Amy on NBC’s show Superstore is an example of how we use the inductive principle in everyday life. It’s a short clip. To recapitulate, therefore, the reasonings of this section: Every idea is copied from some preceding impression or sentiment; and where we cannot find any impression, we may be certain that there is no idea. In all single instances of the operation of bodies or minds, there is nothing that produces any impression, nor consequently can suggest any idea, of power or necessary connexion. But when many uniform instances appear, and the same object is always followed by the same event; we then begin to entertain the notion of cause and connexion. We then feel a new sentiment or impression, to wit, a customary connexion in the thought or imagination between one object and its usual attendant; and this sentiment is the original of that idea which we seek for. For as this idea arises from a number of similar instances, and not from any single instance; it must arise from that circumstance, in which the number of instances differ from every individual instance. But this customary connexion or transition of the imagination is the only circumstance, in which they differ. In every other particular they are alike. The first instance which we saw of motion, communicated by the shock of two billiard-balls (to return to this obvious illustration) is exactly similar to any instance that may, at present, occur to us; except only, that we could not, at first, infer one event from the other; which we are enabled to do at present, after so long a course of uniform experience. An audience member asked Dr. Peter Atkins what his solution is to the problem of induction. Atkins’ response make it clear he had no idea what he was talking about. There’s a transcript below the video player. Questioner: Dr. Atkins, a philosopher from Scotland, David Hume, pointed out that we as human beings don’t really have a rational basis for believing in the uniformity of nature—that the future will be like the past. Dr. Atkins, as a Christian, I can believe that the future will be like the past, or that nature is uniform, because I believe that God created the universe and this universe reflects the uniformity which God has imposed upon through his governing. I’d like to ask, in the atheistic worldview the presupposition that there is no God and that all we have is mater in motion what is your basis for believing that the future will be like the past? Dr. Atkins: Well I don’t believe that the future will be like the past because I believe in continuing evolution. I believe that the universe is expanding and therefore the universe will in the future will not be like the universe in the past. I also believe but at a deeper level—if I could respond there—on the cogency and the continuity of the physical law. Physical laws are commentaries on the behavior of mater and of radiation and whatever else you want to include. And so I see, because matter and radiation don’t change their character, physical laws do not change their character. I see the universe evolving into the future, changing as it goes, but the physical laws that underlying the universe will not change. You can read a full transcript of the debate here. Dr. Bahnsen: Okay, Dr. Stein you made reference to David Hume and his rejection of miracles, have you also read David Hume and his discussion of induction or more popularly the uniformity of nature? Dr. Stein: A long time ago. I can’t recall the… exactly what he says. 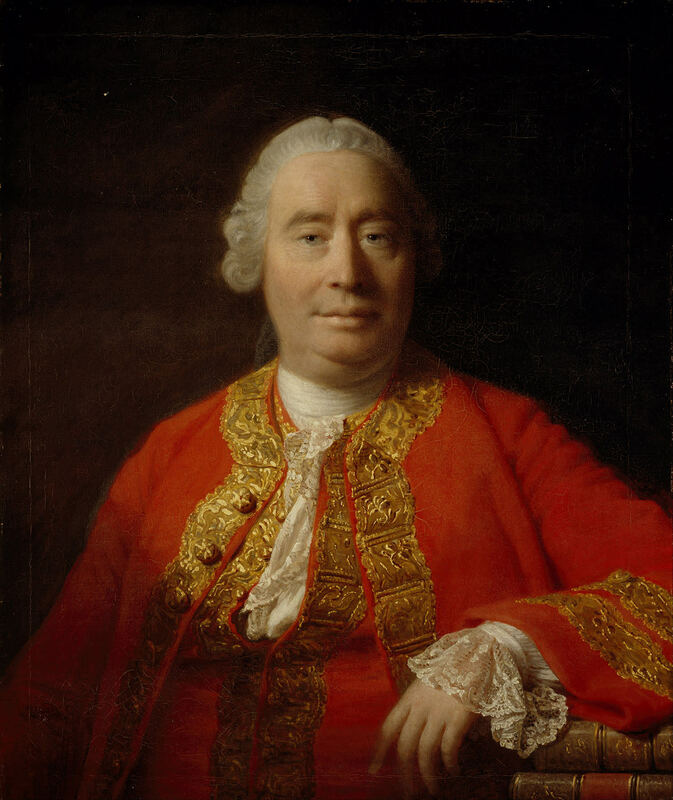 I have read David Hume. Dr. Bahnsen: Okay, were you convinced a long time ago that you had an answer to Hume’s skepticism about induction? Dr. Stein: I can’t answer that question honestly. I don’t remember what…this was at least fifteen years ago that I read this. David Agopian: Excuse me Dr. Bahnsen can we have a question please for Dr. Stein. Dr. Bahnsen: Yea I’m trying to setup the question. Dr. Bahnsen: Hume suggested that there was no rational basis for expecting the future to be like the past in which case science is based simply on convention or if you will habits of thought. Do you agree with Hume? Dr. Stein: Not on this issue I don’t. Dr. Bahnsen: Do you now have an answer for Hume? Dr. Stein: I think he was wrong about that one thing. But he was also right about a lot of other things. Nobody’s perfect. Dr. Bahnsen: What is the basis for the uniformity of nature? Dr. Stein: I went through this but I’d be glad to reiterate it. Dr. Stein: The uniformity of nature comes from the fact that matter has certain properties which it regularly exhibits. It’s part of the nature of matter. Electrons, oppositely charged things attract, the same charges repel. There are certain valances that can fill up the shell of an atom and that’s as far as it can combine. Dr. Bahnsen: Do all electrons repel each other? Dr. Stein: If they’re within a certain distance of each other, yes. Dr. Bahnsen: Have you tested all electrons? Dr. Stein: All electrons that have ever been tested repel each other. I have not tested all. Dr. Bahnsen: Have you read all the tests on electrons? Dr. Stein: Me personally or can I go on the witness of experts? Dr. Bahnsen: Have you read all of the witnesses about electrons? Dr. Stein: All it takes is one witness to say “no” and it would be on the front pages of every physics journal and there are none so therefore I would say yes in effect by default. Dr. Bahnsen: Well, physicists have their presuppositions by which they exclude contrary evidence, too. But in other words you haven’t experienced all electrons but you would generalize that all electrons under certain conditions repeal each other? Dr. Stein: Just statistically, on the basis of past observation. Dr. Bahnsen: And we don’t know that it’s going to be that way ten minutes after this debate then? Dr. Stein: No, but we see no evidence that it’s switched around either? Logic and morality, the inductive, the problem, the so called problem of induction, these are false problems. These are phony problems. You don’t have to define or give a source for these things any more than you have to give a source for digestion. Digestion is one of the ways that a stomach functions. First you have to have a stomach and the stomach functions. And one of the functions of the stomach is to digest food. Digestion is not a thing out there that has to be justified for its existence. Digestion is just one of the things that a stomach does. Logic and reason and induction are not things that have to be justified or sources given for them. They are one, or some of the ways that an organ called the brain functions properly. Even the simplest animals, at a simple level, at a primitive level are using logic and reason. As data comes into their brains they process that data and they make decisions based upon, you know, they’re not even conscious of it. We more conscious animals will sometimes formalize the logic and pretend like it’s a big subject, and it is, you know to formalize the steps of how you would go from A to B to C, and to specify that A is not not-A, you know, the excluded middle, all those things which is fun to do. But logic and induction and reasoning itself don’t have to be justified. They don’t even have to be presupposed. They are not things that you presuppose. You don’t presuppose digestion. Digestion is the way the stomach works. So Paul is asking a non-question when he demands that we atheists somehow have to justify our presuppositions. In my book, I did not say that logic is a presupposition that atheists make. What I did say was that when we’re gonna solve an argument using logic we have to first examine the underlying assumptions. Manata: Are you familiar with the problem of induction? Manata: What is your secular answer for how you resolve the problem of induction? Barker: By saying that the conclusions that we derive from induction are tentative, weak conclusions. They are much weaker than deductive conclusions. The concussions that we draw from induction are useful but not necessarily true. You can have an inductive conclusions that is false and in fact science has repeatedly come up with inductive conclusions that have turned out to be false. So I do not pretend that a conclusion based on induction is a solid fact. Manata: Right but how do you justify the problem of induction. You said you’re familiar with the problem of induction. How do you justify… what’s your secular answer… was it, that it works? Barker: Well, I just told you. It works enough. It doesn’t work perfectly. It is useful. It works, you know. That’s how we know that snakes don’t talk. We’ve never seen a snake that doesn’t [sic] talk. But if we do find a snake that talks. If we do find one in reality, then that tentative law by induction would have to go. We would have to adjust our thinking. Induction is not a very, I mean it’s useful but it’s not a very important logical principle. Lastly, induction. There are also many problems with Mr. Barker’s attempted resolution of the problem of induction. First, it’s a pragmatic justification and not an epistemic one. He said it just works. Secondly, the question is what justifies you proceeding upon the expectation that the future will resemble the past? To say it’s worked in the past and since it’s worked in the past I can assume, with probability, that it’ll work in the future, is to beg the question. Lastly, even Mr. Barker himself thanks that his secular answer doesn’t cut it. In Losing Faith in Faith on page 61 Mr. Barker relays a story by Mr. Bertrand Russell. Basically the story says that in the town of Changsha, China during a lunar eclipse blind men would beat gongs to frighten the heavenly dog who was attempting to swallow the moon. This practice has worked for thousands of years. The point is that just because something works does not mean it’s rational. Dan Barker’s basic justification for the problem of induction is basically beating a gong. Think you can do better than Peter Atkins, Gordon Stein, or Dan Barker? You may want to think again. None of the many suggestions is widely accepted as correct. This isn’t very encouraging. Do you know who’s tried to come up with a solution to the problem of induction? The list reads like an A & C Black list of philosophers: Karl Popper, Immanuel Kant, Rudolf Carnap, Hans Reichenbach, and Nelson Goodman. You can read a detailed discussion of the various proposed solutions here and here. Suffice to say, Christians cite the unchanging nature of God as the reason why we can reliably expect the future to be like the past. To those who say this is a copout please feel free to present your own solution. If you don’t have a solution to offer please remain in your seat until the house lights come up. Non-Christians have proposed many solutions none of which has the weight of the philosophical world behind it.